Well Chickens, we are all hunkered down here in Chicago, Charming Suitor is working away in the dining room with the pup, and I am in the living room taking a moment to say hello to you before I get back to work. My nephew doesn't mind the weather one bit! The upside of working at home as a writer is that I don't have to battle the insanity of the daily commute, I don't have to keep regular hours, and my office can be wherever my laptop is. The downside is that there really is no excuse to take a snow day. My brother from another mother Officer K has a birthday tomorrow, so we are all gathering to celebrate. He isn't much of a cake guy, so I usually make him some kind of pudding or mousse dessert. This is a new one, a chocolate adaptation of the famous Magnolia Bakery Banana Pudding. Decadent, but delish. Beat sweetened condensed milk and water until smooth. Add pudding mix and beat 2 more minutes, cover and refrigerate 3-4 hours or overnight. Whip 3 c of the heavy cream to stiff peaks. Whisk pudding mixture to loosen and then fold pudding mixture into cream. In a large wide 4-5 quart bowl or a deep glass baking dish, layer 1/3 of the wafers followed by 1/3 of the bananas followed by 1/3 of the pudding mix. Continue to layer the remaining ingredients. Whip the remaining cream with the sugar to soft peaks and top the pudding with the whipped cream, and chocolate shavings. This weekend I have a date with this recipe! Oh, that's something I'm going to try! Don't want to rub it in, but it's a nice comfy sunny 65 at my house today! 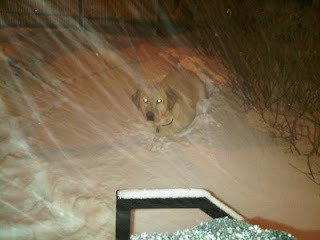 I LOVE the pic of the pup, and even though we might work from home, there is always something decadent about snow days!